...........so why not take a 90 minute stroll and learn about Melbourne's sporting credentials on this highly scenic route? 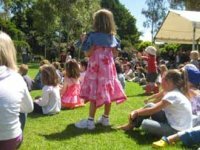 It starts on the opposite side of the River Yarra to Federation Square and returns to Federation Square. .........It's especially interesting to walk by this area early in the morning before 10am or after 3pm when the rowers are in action. 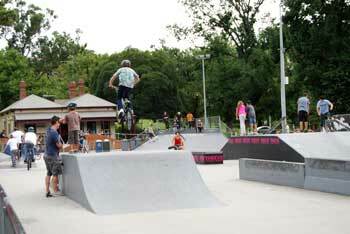 .........I always stop here for a while watching the skateboarders and BMX cyclists doing their jumps. More often than not there'll be some really good kids to watch. ..........It's THE place to go running in Melbourne if you're into that type of thing. See Tan Track. You'll then cross over the river and you'll be on the site of the 1956 Olympic Games - Australia's first Olympic venue. Here you'll find the Westpac Centre, originally the 1956 Olympic Games Swimming Pool venue but now home to Collingwood Football Club (Australian Rules Football by the way!). ...........The Australian Tennis Open is played here every year. Then there's the Olympic Park stadium which was the warm up track for the 1956 Olympic Games. The Hisense arena was built in 2000 and hosts cycling and a variety of other events. This is a state-of-the-art facility with a fully retractable roof. .........It's home to Melbourne Victory and Melbourne Hearts soccer clubs, Melbourne Storm rugby league club and Melbourne Rebels Super Rugby club. Lastly is the famous Melbourne Cricket Ground, known as the 'G'. 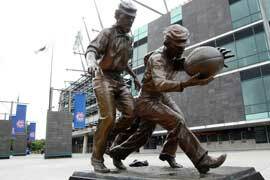 You'll come across quite a few sporting sculptures on this part of the Yarra River Sports Walk by the way. a few of the other things I've mentioned in this website that ARE free to do?! 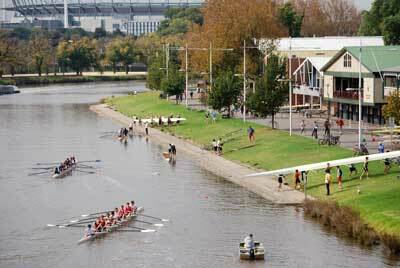 To download the brochure of this walk click on Yarra River Sports Walk.